Election Night 2012 was one marked by disappointment and defeat for the Summit County Republicans. Despite running one of the party’s most active and visible local campaigns in recent memory, members of the GOP spent the evening of Nov. 6 watching race after race fall to their opponents. Democrats won all the way down the ballot, from the White House to the Summit County Board of County Commissioners, while Colorado turned blue on the national stage and the state House of Representatives was returned to Democratic control. Even the Republican’s lone victory – the state Senate seat, which went to Randy Baumgardner – was not won in Summit County. 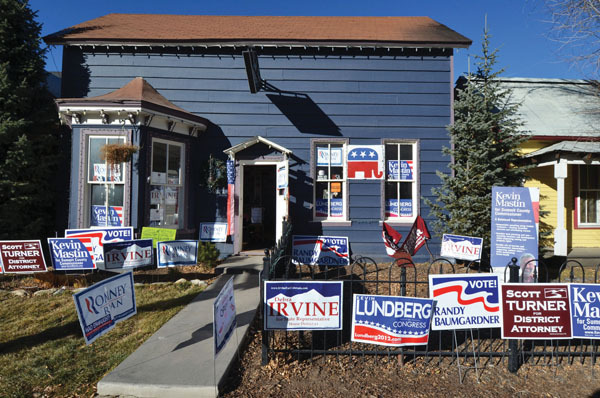 But four months later, the party has had a chance to regroup, take stock and select a new leadership team following the departure of former chair Mark Hurlbert, who left the county to take a job on the Front Range in January. With the 2012 election firmly behind them, local Republicans are ready now to look to the future. And they’re already talking about 2014. The mid-term election will be an important one for the party, with Sheriff John Minor likely looking to win a final term and another opportunity for the Republicans to unseat state Rep. Millie Hamner (D- Dillon). GOP leaders say they’ll tackle the 2014 election with the same heat and hard work that defined the last campaign. Continuing to push their message with the voracity that marked the 2012 campaign starts with fundraising now. The new leaders are working on the party’s Lincoln Day Dinner and annual picnic, both key fundraising efforts. Backas and McGahey took over leadership of the local party organization after a re-election meeting following Hurlbert’s departure. Backas is the mayor of Blue River and a long-time active member of the Summit County Republicans. Although he’s lived in Summit County for more than 30 years, McGahey, who owns a real estate business, is a relatively recent addition to the organization, bringing a new leadership perspective to the party and a focus on the GOP’s fiscal agenda going forward. The two, along with secretary Liz Wickert and treasurer Jay Brunvand, will be leading local efforts to get a Republican representative for Summit County into the state House for the first time in a decade and to help Minor hold on to his seat. Minor has not officially announced intentions to make another bid for sheriff, but said he likely will. With the election still two years away, there’s no word yet on a potential Democratic candidate for sheriff or a Republican contender for the state House District 57 seat. The Republicans say they’re also always welcoming anyone interested in working with them. Those interested in talking to or becoming involved with the party can contact it at info@thesummitgop.org.